Wow. This is going to be a hard one to write without spoilers. (Don't worry! I'll do it!) I wrote in a Goodreads update that Cassandra Clare could write about these characters walking down the street and I would find it an entertaining read. I loved seeing the character growth in this installment -- Izzy comes to mind immediately, but I also enjoyed understanding Alec a bit better. As always, the characters interactions with each other and the love they have for each other made the book. I also loved the setting and scenery in this book...Prague, Paris, etc...what's not to love?! For th0se of you who have read it, there is one relationship that DESTROYED me at the end!!!!!! Let's see how Cassie Clare wraps this series up! And on a random note -- did we ever find out WHY Magnus is banned from Peru?!?! I need to catch up on this series. I've only read the first 2 books so far. I haven't read any on the Infernal Devices series yet either. 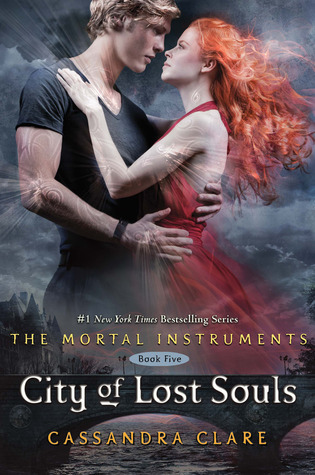 I loved City of Bones and City of Ashes, but I'm waiting for another blogger to read book 3 as a read along with me. He just finished the second book, so it should be soon. Did you like book 5 better than 4? 3 is my favorite!! Sooo good! I really liked both 4 and 5. Equally, I'd say. But you have to read the Infernal Devices, too! Clockwork Angel was okay, but the second one, Clockwork Prince was 5 stars of Amazingness! I have all of the books on my nook. I just need to get through boards and I will have more free time than I know what to do with. Yippppeee!